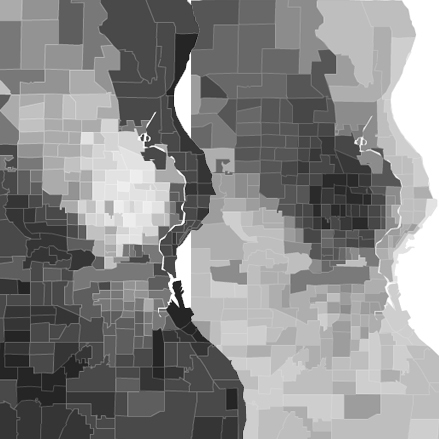 Milwaukee, WI’s segregation (White population on the left, Black on the right). Illustration by Philip Cohen using data from Social Explorer. Race matters. It affects who our neighbors are, our interactions with law enforcement, and where we go to school. A new study by Matthew Hall, Kyle Crowder, and Amy Spring shows how race affects foreclosures, too. In their paper in American Sociological Review, they used RealtyTrac data to examine the U.S. foreclosure crisis in the late 2000s. Using national data aggregated at the block group level, Hall and colleagues reveal that minority neighborhoods were much more likely to experience foreclosures than White neighborhoods from 2005 to 2009. Furthermore, the study revealed a correlation between neighborhood demographic change and foreclosure rates: neighborhoods with declining White populations were more likely to experience foreclosures than neighborhoods with stable White populations. The authors ran simulations of what neighborhood composition would look like if foreclosure rates hadn’t changed after 2005: Neighborhoods would be more racially integrated. It appears housing foreclosures increased both Black/White segregation and Latino/White segregation. Although the authors couldn’t speak to the causes of racially-stratified foreclosures, Hall and colleagues’ study demonstrates that racial inequality was both cause and consequence of the foreclosure crisis.